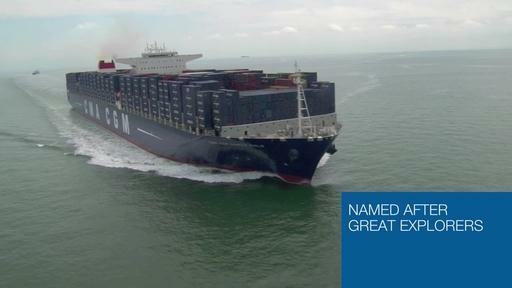 Today, Tuesday 13 November, the CMA CGM MARCO POLO made her first call to the world’s third largest port, the Hong Kong terminal. To mark the occasion, nearly 80 guests (customers, officials, port authorities and the press) were welcomed aboard for a cocktail attended by Rodolphe Saadé, Executive Officer, Nicolas Sartini, Executive Vice President Asia-Europe / Med Lines, Claude Lebel, Senior Vice President CMA CGM Asia, and senior managers from the CMA CGM Asia Regional Office and the Group’s agencies in China. After welcome speeches by Rodolphe Saadé, Nicolas Sartini, Claude Lebel and Captain Krpan, guests were taken on guided tours of the vessel by the crew to see what goes on behind the scenes of this giant of the seas, a veritable technological showcase to protect the environment, before coming together for a cocktail. “We are very proud to welcome the CMA CGM MARCO POLO in Hong Kong, a superlative vessel so huge that HIT Terminal suddenly seemed small. Customers were impressed not only by the size but also with the innovative design and technology. This vessel is adapted to Asia-Europe trade and our network in Asia is fully mobilized to ensure support is in line with the increased capacity,” said Claude Lebel.